Chicken breasts have never been a family favorite. My family loves chicken thighs and will eat them happily, but normally groan and complain when dinner includes chicken breasts. I tend to agree with them for the most part, chicken breast oftentimes turns out dry and unappetizing. It doesn't help that my mother rarely made chicken breast growing up and when she did it had the texture of rubber. Luckily for me she only served it once in a blue moon. She was a great cook, chicken breasts just weren't her forte. When my husband and I first got married I tried making chicken breasts a few times and each time it ended in disaster. Due to this less than stellar history I literally stopped cooking chicken breasts until my kids starting eating solid foods. Once my kids were regulars at the dinner table I slowly started trying new recipes using chicken breasts. Some had the expected dried out taste that I grew-up eating, but other such as the recipe for Mediterranean Chicken Bake from the April/May issue of Taste of Home magazine turned out delicious. This recipe has 8 ingredients. It takes 30 minutes of prep and cook time and makes four servings. I did have to go to multiple stores to find sun-dried tomatoes, but that might be a specific problem in my area. For the herbes de Provence I lucked out and found some on clearance. I found that it took less than the 15-20 minutes for my chicken breasts to fully cook in the oven. I temped my chicken at around 12 minutes and it was done. I did pound out my breast relatively thin and that might be why the cooking time was decreased. I followed the remainder of the recipe as written. Everyone in my house loved this recipe. My husband in particular thought this was one of the best chicken breast recipes he has ever had and for him to like a chicken breast recipe is a feat. 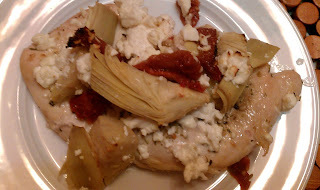 I loved the blend of artichoke hearts, sun-dried tomatoes and feta cheese. This will definitely be a recipe that I would try again. For the recipe go to Mediterranean Chicken Bake. Thanks :) Come back and say hi again soon! Hope you find some recipes that you like! Thank you for commenting on my blog. Yours is amazing hope to half as good someday. Aww, your so sweet, thanks :) Your blog is great, I love that you include so many pics! I have to agree with you, the problem is that the chicken gets too dry, but I still prefer chicken brest to the drums or other pieces. Love your combination of ingredients in your recipe! The problem is that they get too dry. A great recipe keeps the breasts nice and moist, which this one did! The combination of ingredients in this dish were delicious! The recipe looks amazing! I saw that you had checked out my blog through blogaholics. Thought I`d come and check out your blog. I`ll definitely be testing out some of these great recipes! Thanks :) I hope you find some recipes that you enjoy! Everytime I come to your posts I get so hungry! I'm going to try this recipe, sounds wonderful. Thanks :) I hope you like the recipe when you try it!